Here is the Cabinet minute beginning the process of two referenda to consider changing NZ’s flag. Note Minute 1.4 (highlighted) which clearly shows “there must be no presumption in favour of change”. Yet all around the country this stipulation is being violated by government agencies and the people who work for them, on the latest occasion by John Key, the PM who of all people should be that person most committed to abiding by the minutes. Now, this Minute, 1.4 of CAB Min (14) 8/22) is most clearly violated by the decision to hold two referenda, with the first being to decide what flag would be chosen to compete with the current flag in the second referendum. This process, as well a violating the minute above, is clearly a hoax perpetrated by Key and his lame sycophants in the National party, all too cowardly to speak out against something that is fundamentally dishonest. 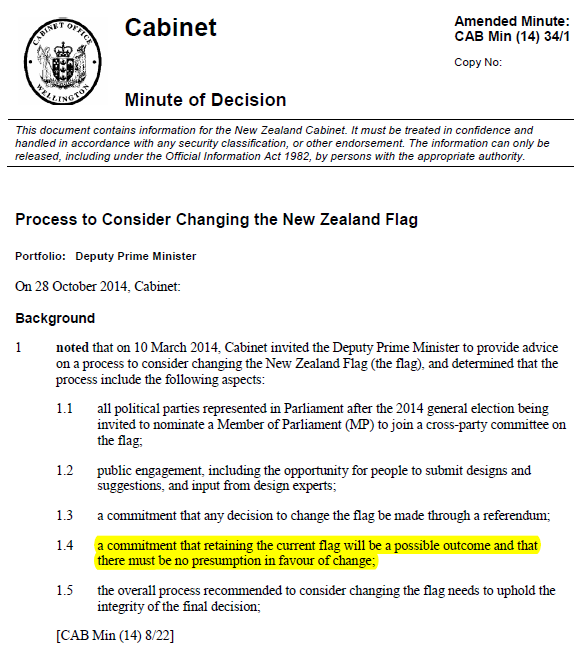 Asked on Monday if the process should follow a “Yes” or “No” format at the first question, allowing people to decide whether they wanted to change the flag before going through the process of considering alternative designs, Key dismissed the idea. That “doesn’t take you very far,” he said. 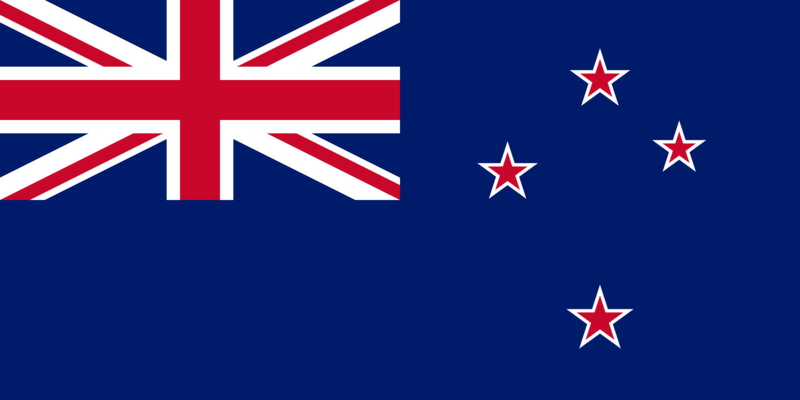 It was entirely possible “we can get it over the line” once New Zealanders had had a chance to consider alternative designs and the merits of changing the flag, Key said . John Key is developing into a serial liar and conman. He’s been caught out on so many mistruths lately it shows he takes us for granted. He thinks we’re fools who he can manipulate and bend to his will as he wants. The minute above is another demonstration of this arrogance. Can you imagine the slimy bureaucratic rats penning it? “Should we really put that part in? It might make things a bit difficult”, they would probably have asked. “Don’t worry”, Key would have replied smugly, “I can deal with it, they’re like goldfish out there”. Who is responsible for policing the terms of the above minute? I guess it can only be some division of parliament. They should be out there ensuring the words actually mean something, but as we know, they’re all tarred with the same deceitful progressive brush. Nothing will be done. We have a hoaxer for PM and until the public at large wake up to what a charlatan he is, we’re stuck with him. I will be voting on the first referendum to keep our existing flag. The will of course invalidate my vote but if enough people can be encouraged to do the same it could send a message to John Key. Well of course it would be very easy to include that question anyway- ie “none of the above” and that would prevent your vote being invalidated. It won’t happen though because they’re dishonest cheats. Red, I agree but if we can get 100,000+ deliberately invalidated votes it would send a message. It would send a message, Chuck – but only if the media covered it, which I doubt they would. KG, not it NZF and the RSA pushes the idea. Yes, I am torn between invalidating my vote, voting for the most henious design or not voting. There are good arguments for each, all of which will be ignore by the government and the commentariat. Take a look at the headline page of Stuff “news” this morning, and that indicates the level (and the dishonesty) of this flag project. Yes I have a design choice it looks like an exact copy of the current flag. Just submitted my design apparently it has to go to a mediator/ Censor.